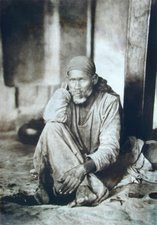 This post is being rewritten, there used to be a list of links pointing to The list of Aartis of Sai Baba performed in Shirdi. Those where only the videos. Now a list of Aartis of Saibaba performed in Shirdi will be provide below. 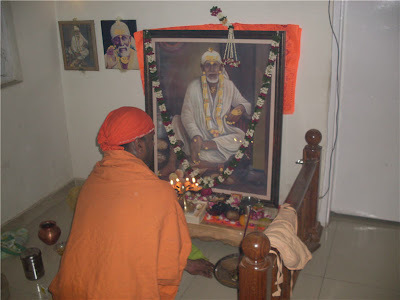 Following the links, will take the Sai Baba devotee to that particular Sai Baba Aarti providing. 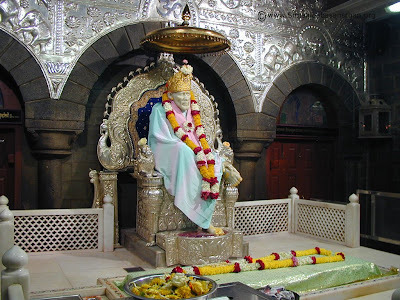 Mp3 download of each aarti songs played by Sri Saibaba Sansthan Shirdi. Aarti is a ritual performed in front of image, idol of deities or Sage and Saints. The meaning of Aarti in Sanskrit points towards developing love towards God or Guru in form of Sat Chit Anand. 'Aa' means towards and 'rati' means virtue. Artis are performed both at Mandir (Temple) and home. 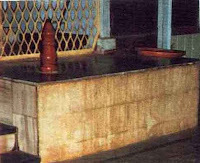 All the Aarti rituals daily performed in Shirdi Temple started when Sai Baba did His leelas as embodied form of Sat Chit Ananda. Aartis are usually performed at five times a day or less than that. Morning sunrise time and evening sunset time are considered as divine evoking times. So these two times are termed as best times for evoking love for God. Aarti as a ritual to evoke the divine feeling thus is performed at these two times. If five Aartis are perfoemed in a day, usually a second one follows in the morning after the sunrise aarti. Noon aarti is performed in the mid noon time. Vocals : Aarti is a simple fire ritual, where devotees gathers often in large number and sings the aarti in unison. It evokes great spiritual energy. Moreover when lot's of people gather and sing the divine lyrics of Aarti all the minds are on one thing, the aarti. Arati lyrics contains the words and shlokas in praise of the divine. 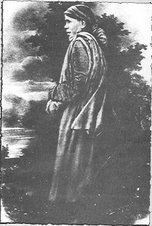 Hence at the subtle and mental level all the participants put their mind on the divine. Rotation of fire lamps : Along with the singing the most important part of Aarti is rotating aarti diyas (lamps lit with wicks (oil or ghee)) (sometimes camphor is also used) in clockwise motion in front of the idol or picture of the deity which is believed to be throbbing with sacred energy and felt by many. One person rotates the lamp while all the others sing with devotion in their heart and mind in unison. The ritual helps the devotee to invoke the spiritual and sacred feelings in them and ward off the evil influences one might have got in the course of daily routine life. For those deep in love with God or the sacred the Aarti brings about divine mystic ecstasy in them. Just as an alcoholic is drawn towards the wine or any other alcoholic drink, the devotee is drawn towards this divinely pleasing ritual of the sacred. 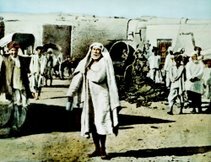 Sai Baba's devotees shouts in the ecstasy "Sat Chit Anand Sadguru Sainath Maharaj Ki Jai" (Victory unto the Guru Sai Baba, the truth, the concsiouness and the divine joy). For those who have still not developed intense love for God, the simple fire ritual of Aarti helps in exorcising the bad effects of an 'evil-eye' (dristi dosha), and regular practice of performing Aartis thus results in developing the love towards the God, the Divine, the sacred, the divine ecstasy. Aum Sadguru Sairam. The lamp fire charged with spiritual energy is taken to all the devotees who pass their hands over it and put the palms on their forehead. A gesture of receiving the sacred energy in thier minds. acoustics in aarti :Along with the singing and rotating the lamp is the acoustic that goes with the aarti. Usually small bells are played. The sound of the bell makes an effect at deeper level of minds. In temple along with the bells, more musical instruments like drums, tabla, blowing of Sankh are played, adding to the sacred and divine environment. Aroma : Another important part of the Aarti is Aroma. aromatic flowers are offered to the sacred. aromatic incense is burnt, dhoop ( a powder of loban or aromatic powder made from herbs and tree barks, prescribed in Hindu tradition, is sprinkled on red hot burning charcoal. This fills the place with aromatic smoke) is done before the aarti. Dhoop is also prescribed in many religion for creating sacred environment and warding off evil energies. Food and cleanliness : Food is offered before the aartis to the divine and after the aarti ritual is over is passed onto all present at the moment. Devotees eat a bit from that as consecrated food (prasad). In the morning aarti the Idol or the picture is given a bath with aromatic water. Before all the aarti begins the place is cleaned thoroughly. Sai Baba aarti mp3 downloads Shirdi Temple - Aartis and chants and songs sung and played in Sai Baba Samadhi Temple Shirdi. with an English Translation, Introduction and commentary. Since there are many aartis only videos have been posted below. Below the the videos are the link given for the lyrics and meaning of each aarti for which another blog has been made. 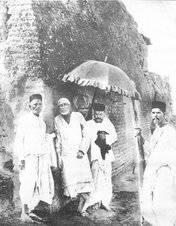 List of videos of Aarti of Sai Baba performed in Sai Baba Mandir (Samadhi Temple), the sacred tomb Shrine of Sai Baba in Shirdi. meaning of kakad a cloth is dipped in ghee this cloth is then wrapped around a stick and lighted with fire to perform the aarthi. 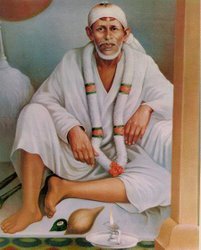 The morning Kakad Aarti begins at 4.15 a.m. in Saibaba Mandir (Samadhi Temple) the sacred tomb shrine of Sai Baba in Shirdi. Download Uttha Panduranga free mp3 Here. 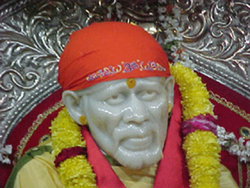 Shirdi Sai Baba Dhoop Aarti (Evening) video with lyrics subtitles below. Above video starts with Aarti Saibaba (<---Click for Lyrics in English, Marathi and meaning in Hindi of Arati Sai Baba). Click Here To download free audio mp3 file of Arati Sai Baba. On the right side of the video you will see a tab written download. next to it select whether you want to dwon load it for windows/Mac or for Video iPod/Sony PSP. Press on the download and you will be able to download the video. However since the file size is too large, you will need a download manager, the download can take quite a long time. 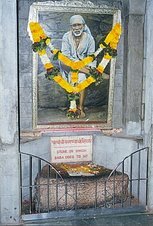 jai shri sai baba ki!!!!! To download the files you need windows xp or higher first download Google Video player and install it and then you will be able to download the videos of Aartis. Large file takes a long time for download, but it is worth as we can watch the Sai Baba aartis and feel like present In Shirdi, while watching. For tamil videos you might search for the same in google video search there are few and i will psot them on this blog too. 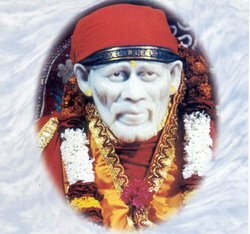 Can someone send me the text format of Shirdi Sai baba Dhooparti. I am not able to find one. You have done a wonderful job. everyday at work I listen and see the aarti's especially the Kakad aarthi. Its beautiful. It gives peace of mind. Thank you so much. Yes Kakad Arati is very powerful, if you listen it online with live darshan provided with Sansthan it will prove more effective. Thanks Raj for pointing it out, we are working on changing the whole layout and this page and make it a better experience for those looking for Sai Baba aartis in Shirdi, Videos audios and lyrics with meaning. You can buy DVD and CD of Sai Baba's aarti performed in Shirdi Samadhi temple, from Shree Sai Baba Sansthan's shop in Shirdi.